The National Day of Unplugging is coming up in just a few short weeks and our partners have been hard at work putting together some amazing programs to help their communities unplug! We’re highlighting a few of the innovative, collaborative and exciting events that are in store for 2017’s NDU. This is just the tip of the iceberg – and there’s still time to plan your own event this year. Let us know what you have planned or how we can help. Join Reboot and Brooklyn Boulders in New York, Chicago and Boston for the National Day of Unplugging on Friday March 3rd. Climb, meditate, and decompress from a week’s worth of seemingly infinite scrolling in a phone-free zone. Shake and stretch your woes away in yoga classes. Step away from the selfie-cam and take some photos in our photo booth. Work with Lynn Gentry for on the spot personal poetry. Color the night away at a giant mindful mural created by LA-based writer and illustrator Chris Noxon in partnership with Print All Over Me and tuck away for conversations about technology use thanks to our partners at Living Room Conversations. Let an evening full of acoustic music and technology-free activities lead you to unplugged bliss. Co-sponsored by Reboot, Brooklyn Boulders, and Lululemon. This event has been made possible in part by the generous contributions of UJA-Federation of New York. Get off your phone and get on your bike! 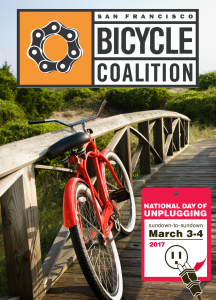 Reboot and the San Francisco Bicycle Coalition are using the National Day Of Unplugging on March 4, 2017 to bring diverse groups together for a symbolic ride of unity through interfaith landmarks around San Francisco. Join them for a 14-mile, relaxed pace, no-drop ride with multiple stops throughout the city that represent unity, togetherness and peace. There will be one stop along the way for water and music by the Saint John Coltrane Church. After the ride, the party doesn’t stop! We’ll lock up our bikes at Thee Parkside, where food and drinks will be available for purchase and a live band will be playing. Even if you can’t make the ride, please feel free to join us around noon at Thee Parkside for the festivities. Join Reboot + Open Temple for the 4th annual off-the-grid Unplugged Party to Celebrate Reboot’s National Day of Unplugging. Check your phone at the door and together we’ll redefine what it means to truly be connected. It’s like summer camp for adults, in the city, for one epic night of pure unadulterated fun. Unplug after a busy week and take time off the grid to feel awesome. Live music, board games, typewriters, analog photo booth, arts ‘n crafts, face painting, and more. Rules: No Work Talk or Networking No Digital Technology, Cameras or Watches We’ll all use Nicknames! This event is dedicated to the memory of our dear friend and collaborator, Levi Felix, founder of Digital Detox and Camp Grounded. $3 of each ticket will be donated to Camp Grounded in his memory. The Jewish Community Alliance of Southern Maine (JCA) is proud to partner with seven local Jewish organizations to offer a broad range of programs exploring the “Shabbat Unplugged” experience over the weekend of March 3-4. We are excited to have built a diverse coalition to provide engagement opportunities for all ages and interests. This innovative community collaboration includes Friday evening open gallery hours at the Maine Jewish Museum in downtown Portland, a Shabbat potluck dinners at Congregation Bet Ha’am, and a series of family-friendly activities on Saturday afternoon at Temple Beth El, including open board games, gentle yoga, children’s story time and drama skits, culminating in a community Havdalah ceremony marking the end of the Sabbath. Events are free and all are welcome! Thanks to all of our partners for making 2017’s National Day of Unplugging the biggest one yet! Stay tuned for more updates on community partner programs and events as we approach the NDU. These events have been made possible in part by the generous contributions of UJA-Federation of New York, Jim Joseph Foundation, Joyce & Irving Goldman Family Foundation, Rosenthal Family Foundation, The Jewish Federation of Greater Los Angeles and YAD of the Jewish Federation of San Francisco. Questions about the National Day of Unplugging? Want help planning a program? Connect with our national outreach and partnership manager, Josh Kanter at josh@rebooters.net. Want to sign up to be a community partner? Do that here.